Back in the early 80’s so called exotic ingredients started showing up in specialty food shops and quality grocer’s shelves. The wildly popular cookbook ‘The Silver Palate’, written by NYC’s UWS food mavens Julee Rosso and Sheila Lukins was my go to guide for ideas to create dishes from such luxury ingredients as goat cheese and sun dried tomatoes. Trends come and go, but, at one time I remember goat cheese served at virtually every dinner party I attended in the 80’s. Whether crumbled on fresh pasta, stuffed in chicken breast or proudly dressing mounds of farm fresh greens it was chic and fabulous. Today almost every grocery store has some form of goat cheese on its shelf, some local, others from France. Goat cheese days as an exotic ingredient may have come and gone but I still include it in many dishes or enjoy it on its own spread over a crusty loaf of fresh baked bread. There are more than a few local cheesemakers using goat’s milk to produce some fabulous cheeses. Steven Jenkins, author of the Cheese Primer, one of the best cheese guides ever written, highly recommends New York State’s Coach Farm goat cheese, stating they set an almost unattainable standard for America’s cheese makers. Coach Farm founded by Milles and Lillian Cahn of coach bag fame was one of the first to produce goat cheese in the Hudson Valley. Miles Cahn often joked that they lived happily held captive by 1000 goats. For over 20 yrs they ran Coach with great success before selling to Best Cheese several years ago. Not much has changed since Best’s takeover. 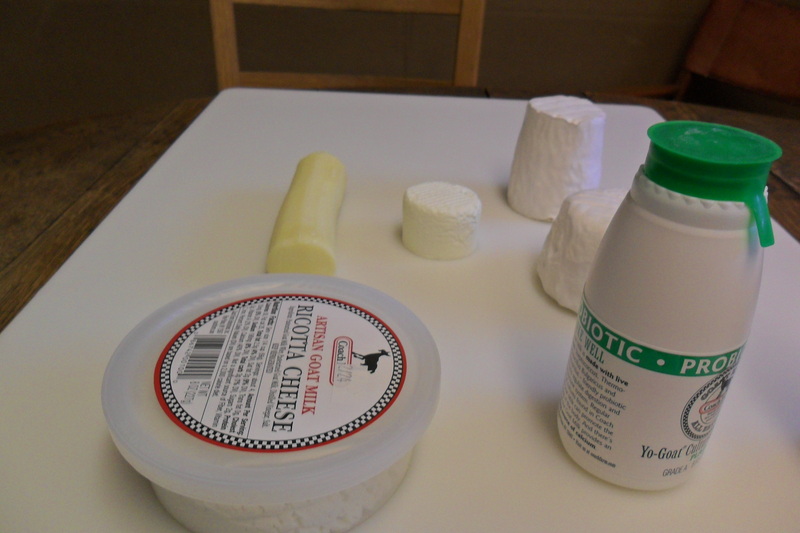 Careful attention to detail and tasty cheese are still being made each day. Being so close I couldn’t believe I had never visited! A few weeks ago I decided it was time to check out Coach Farm’s operation for myself so I planned a visit with my friend Linda, a cheese newbie. Arriving in time for the afternoon milking we were greeted by Willy Bridgham, operations manager. After suiting up in sterile booties, a hairnet and lab coat (to keep our germs from contaminating the cheese making process) Willy guided us through the rooms where the fresh milk is directly transported from the milking parlor and made into yogurt, fresh chevre and other forms of fresh and aged cheese. After seeing the fresh cheese being hand molded into logs we moved on into rooms where specific types of cheeses are cured on wire racks to age and form the gentle pillowy rinds. Cheesemaker Mark Newbold also noted workers peeling the grating sticks that Coach are famous for. Grating sticks were created by accident when some logs were forgotten about and a harder aged cheese was revealed under the rind! 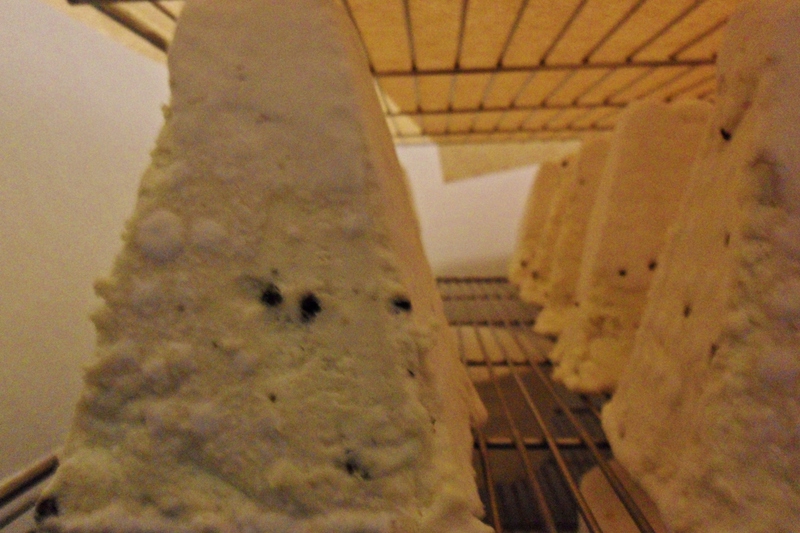 Peppercorn studded pyramids and triple crème goat cheese where also resting comfortably to achieve the peak of ripeness. The sights and smells where all very tempting! Next we toured the barn and milking parlor with Rene DeLeeuw, the man behind the care of each French Alpine goat, the specific breed raised at Coach. Rene and his crew of 8 where very busy with 10 newborns that had arrived earlier that morning. 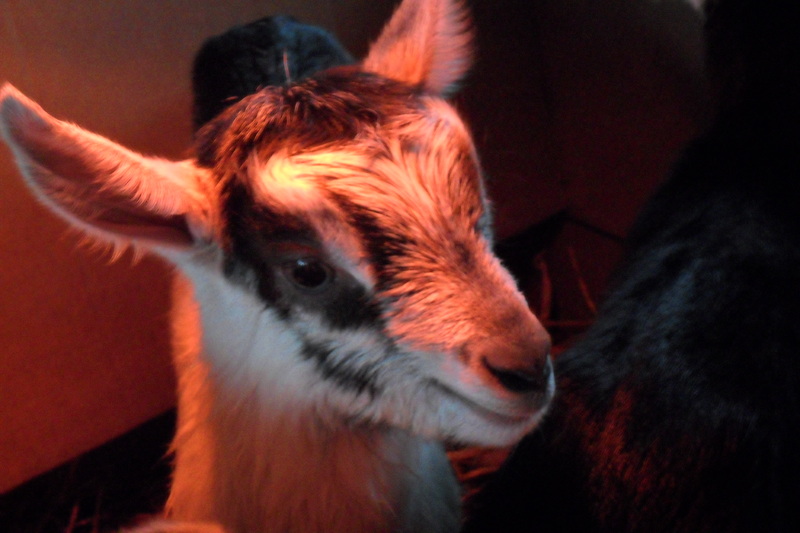 As each goat has its own distinct personality they are all named, this new addition was already being called Tator Tot for its petite size. 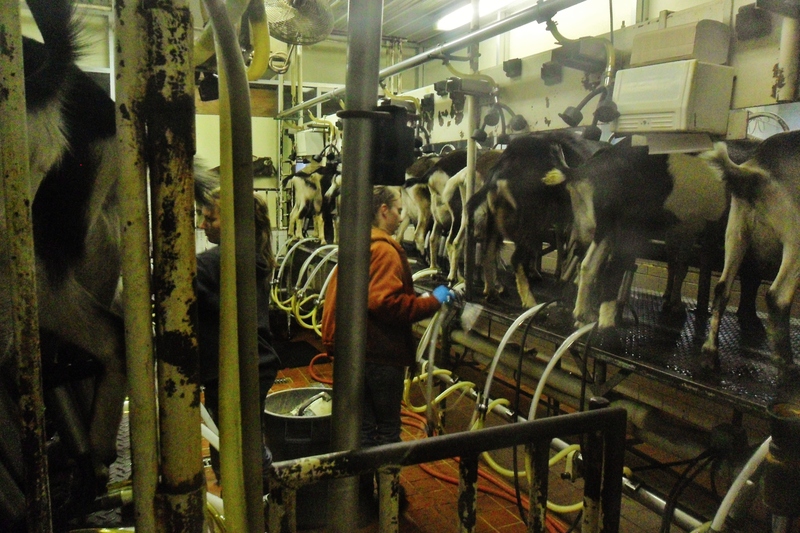 500-600 out of the herd of 1000 are milked every day at 4am and 3pm, 28 at a time every 4 minutes. Rene explained women tend to have a more gentle touch for the work done in the milking parlor, the goats are more at ease. Happy goats produce superior milk! Before each goat is hooked up to the milking system a bit of their milk is manually squirted onto a screen to detect any problems or possible sickness that would pull the goat out of the daily rotation. Then each teet is dipped into a disinfectant solution and wiped dry before it’s hooked up to the milking apparatus, with each doe producing 9 lbs. of fresh milk daily. It takes 10 lbs. of fresh milk to make 1 lb. 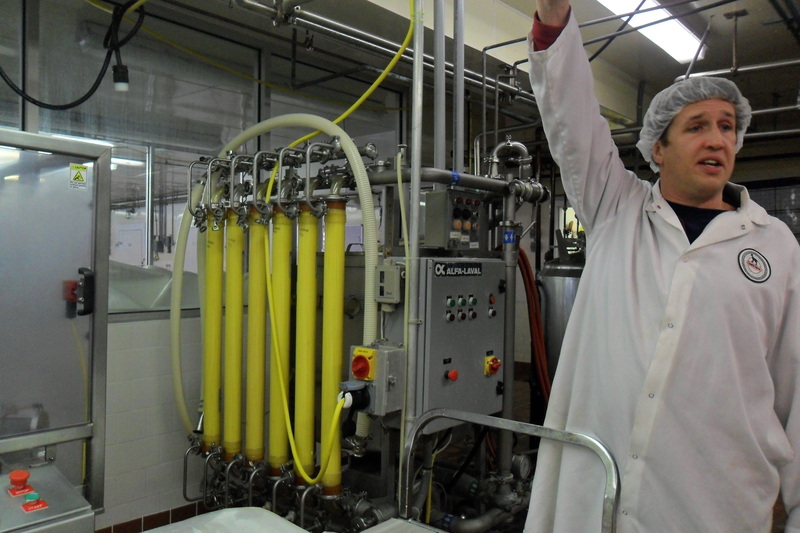 of cheese, the process of turning the milk into yogurt, fresh chevre or aged cheese is started within 24 hrs. 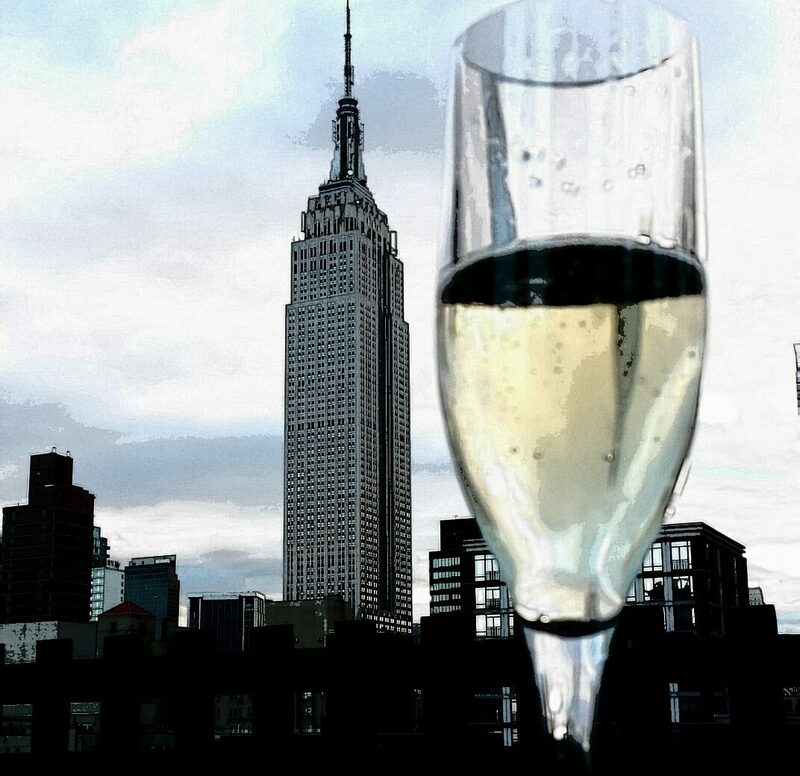 to retain freshness and optimal flavor. A gentle pasteurization is done but milk is not homogenized. 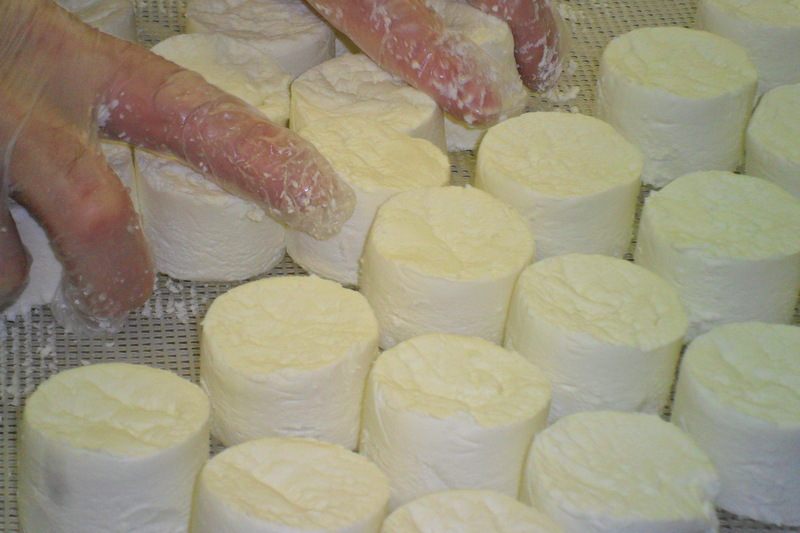 Only microbial rennet is used to start the cheesemaking process. Watching and learning about the inner workings of the farm was fascinating but tasting was even better! As we tasted I couldn’t help craving some local wine to complement the peppercorn studded pyramid and the grating stick! It’s been many years since I first experimented with goat cheese. I haven’t looked at my Silver Palate cookbook in quite a while but still think back fondly on all of the great memories of meals crafted from its stained and earmarked pages. Try this pasta recipe I created topped with a generous amount of shredded Coach grating stick cheese. Wanting to make this a Hudson Valley meal I paired my dish with Hudson Chatham Baco Noir, the bright cherry and slightly earthy flavors complimented this dish perfectly!. Saute shallots, garlic in olive oil and cook till transparent in large frying/sauté pan. Add chicken pieces and cook 2 minutes on each side over medium heat. Add broccoli rabe and sauté for 2-3 minutes stirring to incorporate ingredients. Add wine, butter, salt/pepper and heat till slightly simmering. Add cooked sausage and shrimp and simmer for a few minutes till heated through. Transfer all to large stock pot, add cooked pasta and toss well with sauce over low heat till all ingredients are incorporated. Serve in large pasta bowl topped with grated Coach Farm cheese. This is my kind of day – LOVE visiting farms and learning and watching and touring and tasting! YUM! Seeing the kids being born was amazing! It was a super fun day!